The abandoned mining colony on Elkos IV has been ignored for years. Now, however, two ships have vanished in the Elkos system and there are rumors of riches under the coat of ice that cloaks the dead world. Could there be something to those rumors? Or is it simply the activities of the notorious pirate known only as Luraya? The crew are not the only ones looking for the missing ships...and the truth. 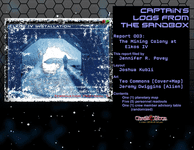 The third issue of Captain’s Logs from the Sandbox takes the crew to the dead, ice-bound world of Elkos IV. This world will not give up its secrets lightly, but those secrets might be worth more than gold and riches. Face six mission complications, each with three twists, five NPCs, a table of space travel hazards, and a table of planetary hazards. Suitable for any space opera science fiction RPG.